York Catholic District School Board has seen an increase in the number of surplus (unfunded) pupil places over the last decade as enrolment has declined. Currently, there are over 6000 pupil places which are surplus (unfunded) to enrolment. Given the Province’s funding model for the operation of school facilities, tests surplus pupil places represent a significant unfunded expense to the school board. As of October 2015, the shortfall in funding to heat, clean and maintain classrooms in York Catholic is just over $5.5 million. If surplus capacity is not addressed by 2020 this shortfall is estimated to grow to over $7 million. The Ministry has set an expectation for school boards to address surplus capacity due to declining enrolment to ensure effective use of Board resources. To comply with this expectation the Board approved a five-year Long Term Accommodation Plan (2015-2020) (LTAP) to address the Board’s current and future student accommodation needs board-wide. The LTAP is in keeping with the Board’s Strategic Commitments to “The Continuous Improvement of Student Achievement” and “To the Effective Use of Resources” under its Multi-Year Strategic Plan (2014-2018) which outlines the Board’s priorities and direction for the future. 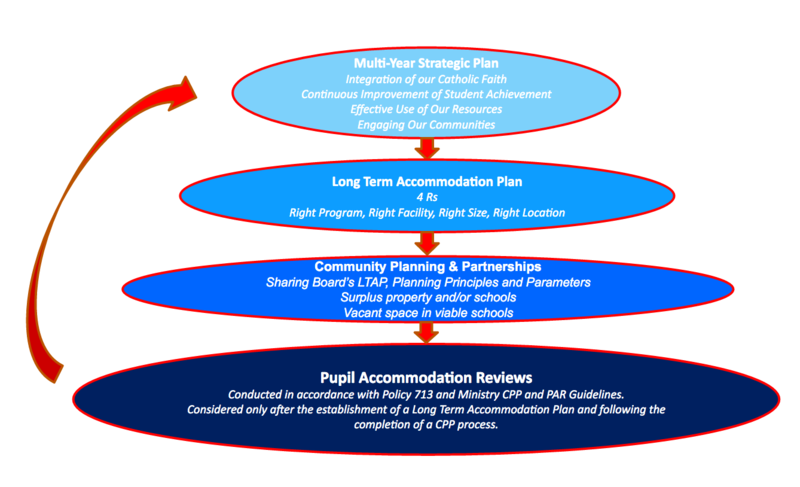 The LTAP outlines a number of accommodation initiatives, including Pupil Accommodation Reviews (PARs) which is a community consultation process required by the Ministry of Education where a school closure and/or consolidation is being considered to address changing demographics, enrolment, programming, and facility condition challenges facing a school or schools in a particular area under review. This process results in a number of recommendations to Trustees to address those identified challenges that may include school consolidation or closure. The PAR process provides opportunities for community participation through public consultation. The Multi-Year Strategic Plan, LTAP, our Community Planning and Partnership policy (#704) and Pupil Accommodation Reviews are part of a larger Board process to provide the best supports for student success and achievement over the long-term. Working together with our school communities, the PAR process will help the Board ensure that we are efficiently using available space to accommodate students over the long-term while continuing to offer the high standard of program excellence in innovative, faith-filled learning environments that our students deserve and that our parents expect. Throughout the process we will keep you informed every step of the way.